Is Frank Z the perfect place for a Food Truck HQ? I listen to APM Marketplace when I run in the mornings. This morning they had a story about the LA Food truck biz- and it got the gears spinning. The food truck fad is sweeping the nation. View photos of some LA food trucks and add to our collection by submitting photos of your favorite neighborhood food truck. Today on Marketplace, Kai Ryssdal takes us out to lunch for a story on the food truck economy in Los Angeles. But LA isn&apos;t the only city known for its mobile food. Cities like San Francisco and New York are inventing new ways to deliver good food to your street corner. In Chicago, an effort is underway to make mobile eateries legal on city streets. via Marketplace Photo Gallery: Food Truck Nation: Photo Gallery. What does this have to do with Dayton? And why should UD consider this? Besides having an abundance of unemployed truck builders in the community- and a plant that makes the Sprinter van, we could have a great synergy project. Location: You need a central depot for a region, where the vans can be stored indoors overnight, restocked, cleaned, maintained- etc. the former Trolley barn which became Frank Z Chevy would be perfect. Business plan: UD has a strong history of student business development programs incorporating real world experience. Considering food trucks are primarily a summer business- the students could begin designing a business model, a brand, at the beginning of the year- and by summer- be out working in the trucks testing their business skills. Culinary skills: Sinclair has a culinary program- what better model to test your skills- than a mobile kitchen? Vehicle maintenance, conversion: Sinclair has an automotive program- students could work on an actual fleet- both in maintaining the vehicles and in the conversion process. The trucks could also be leased to local chefs- who could share in the buying power of all the food trucks buying local produce etc. to create a gastro-economy in Dayton. I’m sure restaurant owners might initially resist the idea of competing with lower overhead kitchens on wheels- however, they could also run their own- taking their cuisine mobile. Hopefully- this could be pulled off without public money- and we could also see a great building saved. And maybe we can jump start a cottage industry of converting trucks into high class kitchens on wheels right here in Dayton. Hopefully…………..why not absolutely NO public money? I dunno David, the roach coach seems like it was more popular among factory workers, that office workers were far less likely to be seen picking through cellophane wrapped sandwiches in their heels, looking for the one with the most lunchmeat. There’s something about consuming food purchased out of the side of a truck that isn’t as attractive as it was thirty years ago, unless of course you’re at a festival, they have an awning out and it doesn’t look like a truck. Even the ice cream trucks seem to drive around aimlessly these days with very few takers. On the other hand, when I visited New Orleans years ago I was mesmerized by the Lucky Dog carts everywhere…. SW- You have to look at the story in the link- these are far from “Roach Coaches” – they are gourmet kitchens on wheels- working social media to move locations- and build a customer base.. This ain’t your roach coach. I love that truck! And the pulled pork sandwiches are pretty damn good too. Not long ago street/mobile food were pretty much absent from SEA, aside from a few grungy taco trucks in South Seattle. The city made a choice to be a bit less draconian about regulating them, and we’ve seen a bit of a renaissance. And it’s mostly pretty fancy stuff, although still reasonably priced. Some of them (The burger with bacon jam and cambazola cheese at Skillet) are generating a somewhat fanatical following. The reality in Dayton is, unfortunately, that the market and the number of customers downtown has dropped to the point where it no longer makes economic sense to be a “street” vendor. We (Dayton’s Original Pizza Factory) have been a Courthouse Square lunch vendor for the past 15 years or so, and have seen the number of vendors dwindle from 10 carts to 2 carts. And there often really isn’t enough business for 2 carts. It’s sad and frustrating, because the Square is such a very nice space. And I’m old enough to remember “Downtown Dayton Days” and the “Affairs on The Square” every Friday afternoon, where a beer truck and band seemed to suddenly appear as the 5:00pm end-of-the-workday whistle blew, and hundreds of people (even people from the ‘burbs!) started their weekend by enjoying Downtown Dayton. But I’m waxing melancholy, aren’t I.
I can tell you from many years of experience that The City and County really do encourage “street” vendors (they’ve been very supportive over the years, and continue to be so), but the shrinking market has made it difficult to make a viable business out of it. @Bill- I appreciate what you’ve been doing- but the downtown scene isn’t the only place to be anymore thanks to sprawl. These mobile kitchens can show up anywhere- even at Teradata or LexisNexis. The idea of a central depot- in an old Trolly building- tied together with entrepreneurial students- was to create some energy. Maybe the business is outside of bars- maybe the business is a mobile bar? Courthouse Square isn’t a food destination because there are only 2 carts- instead of 10. Would there be business if there were 10? Would the pie increase in size or the pie get cut into smaller pieces? A lot has to do with perception. I know there are a lot of students at Sinclair that could be enticed over if we had bike share…. I looked at the pictures before I posted David. 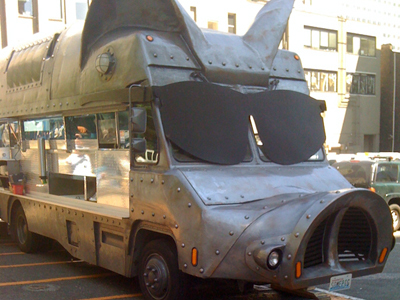 Maybe the Maximus Minimus does have the best BBQ in Washington as dwj says, but to me it looks like a cross between a swat team and the old hunch back moose that wandered off screen at the begining of every episode of Northern Exposure. I just don’t find it aesthetically pleasing nor can I equate it to gourmet food, in my mind. The problem in Dayton isn’t a lack of imagination or ingenuity, it’s that the potential customer base doesn’t have two Georges to rub together when it comes to discretionary spending and the vendors don’t accept WIC cards. True to form though, Mikey wants to chain himself to the Moraine plant when the wrecking ball comes because they’ve already invested a million of taxpayer money in a study on what to do with it and he wants to invest millions more in keeping it standing. Rick, I wouldn’t say it’s *the best*–there’s actually some really good BBQ in the city if you know where to look. But it is quite good. (Of course, as is often the base with BBQ, it’s in dive bars and other sketchy looking places. I’ve never had really great BBQ in a restaurant that looked particularly clean…). And I while the MM truck may not be high art, it’s a pretty cool site to see in person. One cool thing about some of the more ‘gourmet’ food trucks in Seattle is that they don’t have a place where they live–they go to different locations every day for lunch. They have websites with the schedule. I was recently at the UW-Bothell campus (about 20 miles from the city) where some trucks come once a week. Because it’s a “special” thing everywhere they go (and there’s nowhere to go for lunch at UWB except a sad looking Subway location) it was a big deal; some people brown bag it except for the truck day. Repeat at other office parks, neighborhoods, etc. In the evening, they go to drinking neighborhoods or outside of the Mariners game or other sporting events. This seems to work well. Send me a note when you get here: [email protected], and I will welcome you with a delicious pizza. And while there have been a lot of snarky comments on this post- including on Facebook- saying “Can’t agree with Esrati on this one”- “Food truck builders” has been a rising search term on my stats. In this “new economy” of freelance talent- mobile businesses is a growth market. You read it here first. Loved seeing this article. I grew up in Dayton, and have considered eventually moving back and buying a food truck. I’ve been to the Maximus truck pictured above and it’s barely average IMO. Now the Skillet burger with bacon jam cambazola and arugula djw mentioned is fantastic, and the poutine from the same truck, wow. These are NOTHING like the “roach coaches” you used to see. They have higher end menus with fresh local handmade food, constantly changing small menus, all at a very reasonable price due to the low overhead and non existent marketing budgets (usually done via social media and word of mouth). The great thing is you don’t have to always be downtown at the square, or at Frank Z, or in any one location. Each truck can find a spot that works for them. You can do breakfast, lunch, dinner, late night last call around the bars, or any combination of the above. Thought I read something a while back about a student-run taco truck that operated around the UD campus really late night? Did you see the Food Network has a new show Great Food Truck Race? Anyone tried the Fressa Truck at Webster St market? I was in Portland Oregon..in downtown in many places there can be seen a row of food trucks or trailers…on many streets.